A truly ‘green’ design: mature tree ferns and contemporary woodland planting. This is part of a communal garden, so part-enclosure was necessary to maintain some privacy. The horizontal battens only half-hide the view beyond and also create a unique feature window: a circle view hole cut in the trellis. To interlock the shapes, the circle appears again in the York stone mosaic paving made with cobbles. 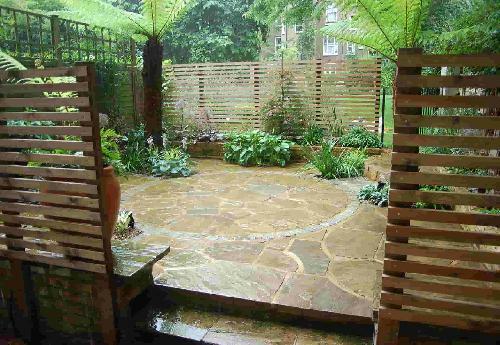 The raised beds made of reclaimed bricks host the green themed planting while a large terracotta pot with a specimen fern serves as a focal point.